September 20th, 2018 – Colorado is the leanest state in America, according to a new State of Obesity 2018 Report, which is a joint collaboration by to non-profits, the Trust for America’s Health and the Robert Wood Johnson Foundation. Eagle, Colorado was singled out as the leanest area profiled in the report. Colorado is the leanest state with a 22.6% obesity rate. Hawaii and Washington DC were the only other areas with obesity rates below 25%. While that’s better than other states, the bad news is that in 2017 the obesity rate stayed level or increased in every state. 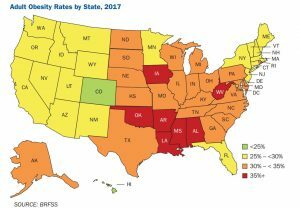 Iowa, Massachusetts, Ohio, Oklahoma,Rhode Island and South Carolina — had significant increases in their obesity rates from 2016 to 2017. Alabama, Arkansas, Louisiana,Mississippi, West Virginia, Iowa and Oklahoma were 7 states where obesity rates exceeded 35%. Not a single state had statistically significant decreases in obesity rate over the last five years. Shockingly, in 1985, not a single state in America had an adult obesity rate higher than 15 percent. There are many health risks associated with obesity, including type 2 diabetes and certain cancers. The State of Obesity 2018 Report estimates that obesity costs an extra $149 billion annually in direct healthcare spending, and another $66 billion in lost productivity.